Superannuation Funds - How important are fee differences? All working Australians will have some form of super. Most of us do not have the time, skills or savings balance necessary for a Self Managed Superannuation Fund so we just go into our employer chosen superannuation fund or another fund of our choice. These are generally split into retail and industry superannuation funds and all of us would have seen the advertisements on television advocating the superior returns offered by industry funds over retail funds. Super funds most often operate as a fund of funds. Although some of them are starting to build out their own internal investment capability, most of them actually just outsource the investment task. That is they pay fund managers (the same people who offer managed products) to invest for them. Because they are placing such large amounts they can generally do this for quite a low cost. I have no real preference for superannuation funds which manage the money themselves versus those which outsource the task. There are pros and cons for both which I will go into in a post next week but they are quite different to evaluate. Who are the people running the fund, how long have they been there and what has their track record been? How stable is the investment team? What sort of alpha are they aiming for? What are the fees they are charging to achieve this alpha (out performance)? Occasionally, as an investor, you may end up with a small parcel of shares in a company. You may end up with this as a result of a share issue by your employer, due to a corporate action in another share you may own or you may even have shares gifted to you. They are annoying to sell because trade costs are often fixed up to a certain limit. Like many people I know, although I am primarily self interested (i.e. I'm trying to improve my life and financial well being), I am also concerned with how my actions impact those around me as well as the environment. I think there are very few truly selfish or truly selfless people. I think everyone falls somewhere between those two extremes. Although we all try and make a difference, sometimes it is hard to see how "doing our little part" makes a difference when there are such big entities and companies out there who swamp any effort we may have to make a difference. One of the ways that has become more popular in the last few years is the idea that money talks. That if you (and a significant number of others) are concerned enough about society then you will direct your savings and investments towards those enterprises which are actually doing good and avoid those which are damaging society or our planet. It is a fairly simple concept which is incredibly hard to implement for one single reason: We all have different ideas and tolerances for what is good and right. Having said that - if we find a company that we like and believe is doing good then this is where we should put our money. I think I may be a naturally cynical person - if something is offered to me for free and gives me value for nothing then I wonder what the catch is. In fact, I almost didn't sign up for my employee share plan because I thought there must be a catch...surely my employer wasn't giving me cash for free! As it turns out though there are some things which are for free to you but which gives non monetary benefits to the organisations which offer them. Some organisations extract value from a "loyalty" type scheme - i.e. if they can convince you that the "free" loyalty points you are earning with them are valuable enough then you will continue to use them even though there may occasionally be a cheaper alternative. Others get value from know what types of products each of their consumers like to buy. This is not a complete list by any means. In fact if you know of other great deals share them below and I can add them to the list. But these are some of the basic free (or very cheap) cards that you should probably have (as an Australian consumer). One of the biggest problems that young people have (especially young professionals) is how to 'get along' or be friends with others at work but at the same time maintain the level of professionalism that you require in the workforce. This is something that all young professionals should think about but rarely do. Why do people have trouble distinguishing between friends and colleagues? One of the biggest reasons that people find it hard to distinguish between friends and colleagues (especially when they are first starting out) is because, for most people, in their previous educational careers, your friends are largely drawn from the group you spend most of your time with. Think about your friends - where did most of them come from? The chances are they were from high school or university. I recently moved out of home and set up my apartment. I posted tips on how you could do this without breaking the bank. I had a goal of $2,000 to set up the whole apartment (excluding bedroom furniture which I already had) and in the end I spent ~$1,500 (which surprised me). I managed to do this because a lot of the goods I purchased were either a) second hand or b) non branded. You bought second hand goods?! I could never do that! I've already told you how you can save money setting up a new place but in this post I am going to tackle the snobbery (for lack of a better term) that some people have when it comes to second hand goods. This month was a much more 'normalised' month from an expenditure perspective. Although I didn't save as much as I wanted to because I was paying off credit card debt from last month's expenditures (related to setting up my house) I managed to keep every other account under control. One of the reasons I continue to track my personal expenditure is that I actually earn a very good income and the one problem that comes with this is that your standard of living and the amount of money you spend typically increases with how much you earn. This year I have several aggressive financial goals and tracking my expenses and budgeting is an important part of my journey. Below you can see my detailed expenditure tracker for this month. As discussed in last month's post I have totally changed the way I track my expenses to give a great degree of clarity on where I am falling behind or am ahead. 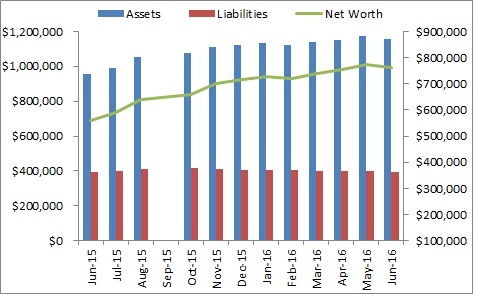 After a rocky start to the year last month, I have seen some growth in my net worth this month which interestingly did not come from my share portfolio. My share portfolio was up significantly in the middle of the month however I got a bit unlucky with the timing of some share trades and the portfolio only ended up slightly for the month. Rather this month was driven by decreased personal expenditure, a paying down of my credit card debt and some savings into short term savings accounts which I will discuss later. As with last month, my target for this month was a very achievable $480,000 and I am glad to say I have achieved it. My targeted $550,000 for the year ending June 30 is looking quite unachievable however I will be happy if I can crack the half million mark by this point. Below I have outlined both the positive and negative factors affecting my net worth performance this month.